Cielo is ideal for corporate events such as meetings, seminars, and conferences. We can accommodate large groups of up to 500 with theater style seating and can provide space for small and medium sized meetings. Our facility is designed to provide you maximum flexibility in room set-ups and configurations. We will work with you to plan and execute your event to ensure maximum meeting productivity, efficiency and cost-effectiveness. Our facility incorporates audiovisual equipment and essential connections needed to facilitate presentations and communications. Our main Pine Room can seat 350 (located upstairs from the conference center), is perfect for large business meals and events. Please see our pricing for the main room for more details. *Friday and Saturday nights are charged $2000 for entire lower level. 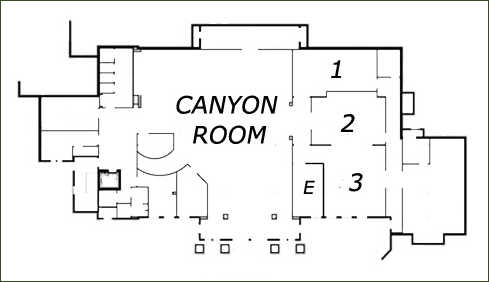 *Canyon Room is charged at $200 per hour on Friday and Saturday nights. **Includes Executive room with lounge seating and a 50" LCD screen. Includes tables, chairs, and internet access. LCD's, projectors, screens, and wireless microphones are available at an additional cost. Please ask about AV pricing for details. Please note that set-up and clean-up time must be completed within the time frame listed. Meeting Rooms 2 and 3 can be combined with a retractable wall for a customized meeting space. Meeting Room 2 comes with a conference table and 10 chairs.